The state prosecutor has opened an investigation into allegations comedian Bassem Youssef & the MBC network threatened national security. A US Congressman has pressed the White House on its efforts to free Al Jazeera journalists detained in Egypt. Speaking at a House Armed Services Committee hearing on Tuesday, Hank Johnson said freedom of the press was an important part of any democracy. Egypt's Interior Ministry has accused the ousted president's Muslim Brotherhood group of forming a military wing to stage attacks on the security forces. In a televised statement, the ministry spokesman Hani Abdel-Latif named 12 people he said belonged to the alleged military wing. He said five were arrested and aired what he said was one of their confessions. He said the group, headed by the Brotherhood province's leader, killed five policemen in a drive-by shooting last month in the southern province of Beni Suef. A former Egyptian presidential candidate has said an ongoing crackdown by the military-backed interim government has turned the country into a "republic of fear". Abdel-Moneim Abolfotoh, reiterated his decision that he will not contest upcoming presidential elections expected for the spring, denouncing the vote as a "farce" since it will come amid "suppression". "You created the republic of fear'', said Abolfotoh in a Sunday news conference. A popular Egyptian dissident leader under ousted president Mohamed Morsi has said he will stand in upcoming elections, in a contest likely to pit him against Field Marshal Abdel Fattah el-Sisi, according to the AFP. The announcement on Saturday by socialist activist Hamdeen Sabahi, however, signals growing concern among some Egyptians over a return to military rule if Sisi wins. Although the widely popular Sisi has yet to announce his candidacy, the field marshal is expected to contest and win the election, scheduled to be held by mid-April. 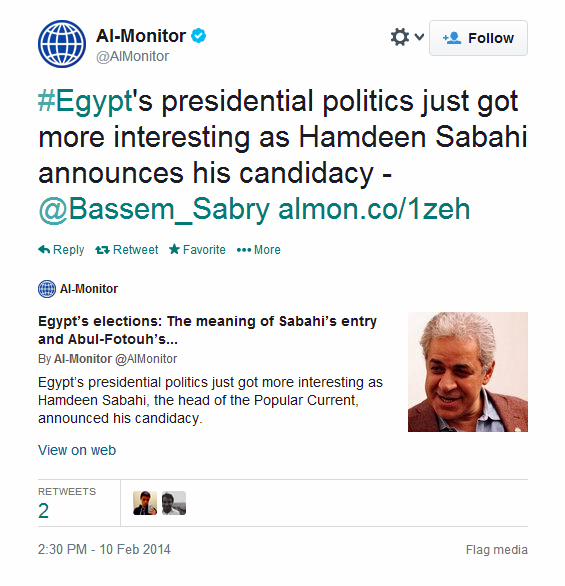 Sabahi had placed third in the 2012 elections that Morsi won. After a year of turbulent rule Morsi was overthrown by the military following massive protests demanding the Islamist's resignation. Sabahi was a leader of the National Salvation Front which organised protests under Morsi. He was also a leading dissident against veteran strongman Hosni Mubarak, a former army man who was overthrown in an early 2011 uprising after three decades in power. In a speech to his supporters, broadcast on live television, Sabahi announced his nomination to chants of "our vote is for Sabahi." 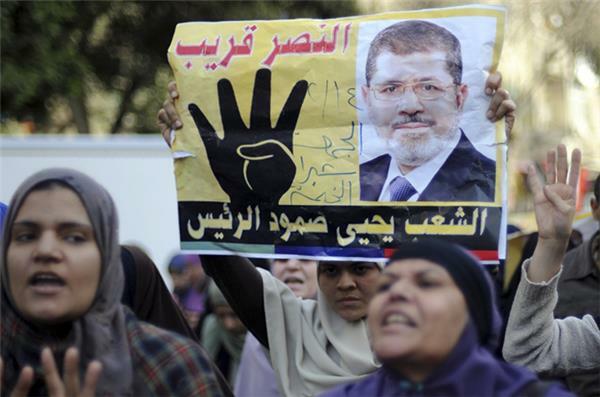 He denounced both Morsi and Mubarak, whose regime critics say is being resurrected by the military installed government. 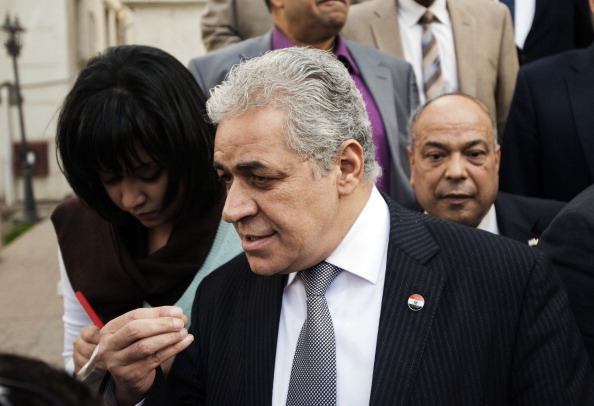 "We will wage a clear battle," Sabahi said. "I hope my decision has pleased the youths and respected their demands." Egypt's military spokesman has said airstrikes in the northern Sinai Peninsula have killed 16 men with ties to the Muslim Brotherhood. Col. Ahmed Mohammed Ali said on Saturday the airstrikes targeted hideouts of "terrorist, extremely dangerous takfiri" armed fighters late Friday in the eastern border town of Sheikh Zuweyid. He described the targeted armed fighters as affiliated with the "terrorist" Brotherhood group. It was the fourth such airstrike with a high death toll since armed fighters downed a military helicopter in a nearby area on January 24, killing all its crew members. Anti-government group Walla' is claiming responsibility for the bombing in that injured six people in the Giza district of Cairo. Walla' defines itself as an anti-government group that has no political or religious affiliations. The group made the announcement on their Facebook page. Read Al Jazeera's full report here. BBC correspondent and anchor Lyse Doucet speaks out against the continued detention of Al Jazeera Journalists. We join our voices with friends & colleagues in #Canada today who meet to declare #FreeAJstaff . Tks to @yeti2yeti for organising. UN High Commissioner for Human Rights Navi Pillay speaks on the detention of Al Jazeera staff. Journalists trying to carry out their work in Egypt are now confronted by an extremely difficult and dangerous environment. They should be protected not prosecuted. Al Jazeera in particular has been targeted to an extraordinary degree, with the Prosecutor-General saying he intends to bring to trial 20 people alleged to have worked for the company’s three channels. It is not a crime to carry a camera, or to try to report the truth. It is not a crime to criticise the authorities, or to interview people who hold unpopular views. Journalists should not be arrested, or beaten up, or sacked, for reporting on sensitive issues. They should not be shot for trying to report or film things we, the public, have a right to know are happening. I have urged the Egyptian authorities to promptly release all journalists and other media employees imprisoned for carrying out legitimate news reporting activities, including Mohamed Fahmy , Peter Greste and Bahar Mohammed. Mohamed Badr, a cameraman for Al Jazeera Mubasher Misr is seen holding his newborn son after being released by Egyptian authorities where he was detained for more than five months. Two explosive devices detonated on Friday near a police checkpoint in Giza, on the outskirts of Cairo, wounding six people, the government and security sources said. There was no immediate claim of responsibility for the blasts. The Interior Ministry said four policemen were wounded. Two explosions have been heard in the space of two minutes in a busy district near Egypt's capital. 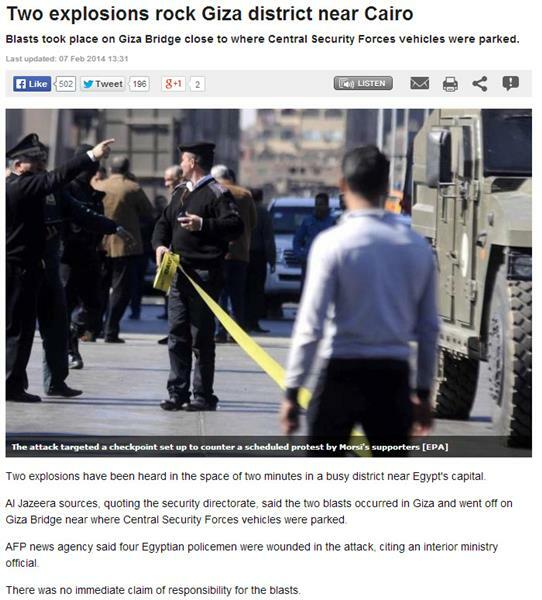 Al Jazeera sources, quoting the security directorate, said the two blasts were in Giza and went off on Giza Bridge near where Central Security Forces vehicles were parked. Read more to get updates on the story. An Egyptian court has ordered a retrial of 62 people who have faced court before over the worst football disaster in the country's history. Seventy-two people were killed after a pitch invasion in 2012 in a case that shocked the nation and led to uproar, protests and more deaths in riots. Some of the 62 had been convicted, others acquitted. The list of people being pursued by the Egyptian authorities in the case involving Al Jazeera English’s detained journalists has finally been officially served, allowing the network to comment on the case for the first time. Nine network staff are on the list of twenty, meaning most of those named are not employees of Al Jazeera. Three have been in detention since December 29th – Baher Mohamed, Mohamed Fahmy and Peter Greste. Added to their names are British journalists Sue Turton and Dominic Kane. Turton is a seasoned former Sky News, ITN and Channel 4 journalist, who has reported from Afghanistan, Libya, and most recently, Ukraine. She has won two Royal Television Society Awards during her 25-year career. Kane joined Al Jazeera English in April 2012 after more than a decade at the BBC. He is an alumnus of Cardiff University’s School of Journalism. Both reported from Cairo in the aftermath of Morsi’s ouster. Others named are Egyptian producers and engineers working for the network in Doha, all of whom refute the charges against them. Yesterday, Dutch journalist Rena Netjes posted on Twitter that despite never having worked for Al Jazeera, she believed she was implicated in the case by the Egyptian authorities because she once spoke to Mohammed Fahmy in a hotel lobby. “The allegations and actions of the Egyptian authorities are extraordinary, unjust, and unacceptable. Journalists exist to cover and challenge all sides of every story, so the idea we would broadcast “false news” is not only totally wrong, it is also a challenge to journalism itself and the critical role journalism plays in informing people worldwide what is really going on. “I am astounded that a warrant is out for my arrest because of my reporting in Egypt last year. I didn’t treat the situation there any differently to every other story I’ve reported on in almost 25 years as a TV reporter. I have no allegiance to any political group in Egypt or anywhere else and no desire to promote any one point of view. Al Jazeera Arabic’s Abdullah Elshamy is currently in the third week of a hungerstrike against his ongoing detention by the Egyptian authorities which began last August. 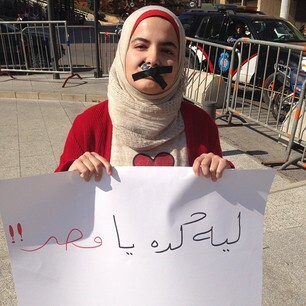 The case of the detained journalists went viral on the internet yesterday, with people around the world posting pictures of themselves with their mouths taped, holding up signs with the hashtag #FreeAJStaff. Their release has been supported by media outlets, press freedom organisations, and yesterday was also backed by the White House. An Egyptian court has adjourned the murder trial of ousted president Mohamed Morsi to March 1st to review video evidence against him, AFP news agency reports. 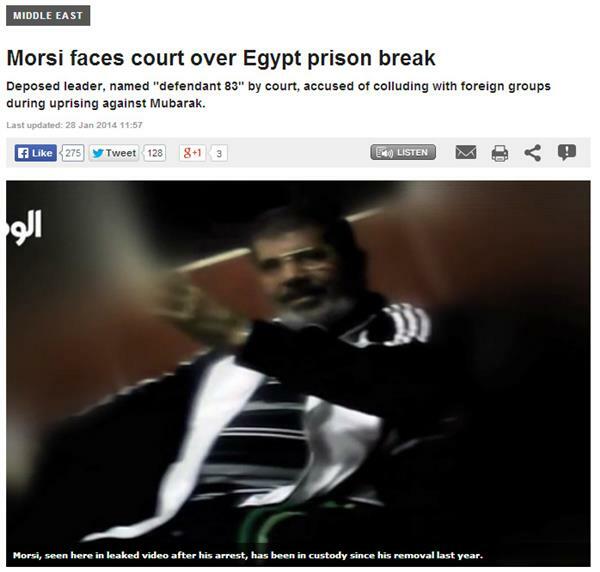 Morsi and 14 co-defendants, some of them former aides, are charged with inciting the killings of opposition protesters outside the presidential palace in December 2012. Here's a clip of Christiane Amanpour's support for the Al Jazeera staff held in Egypt. 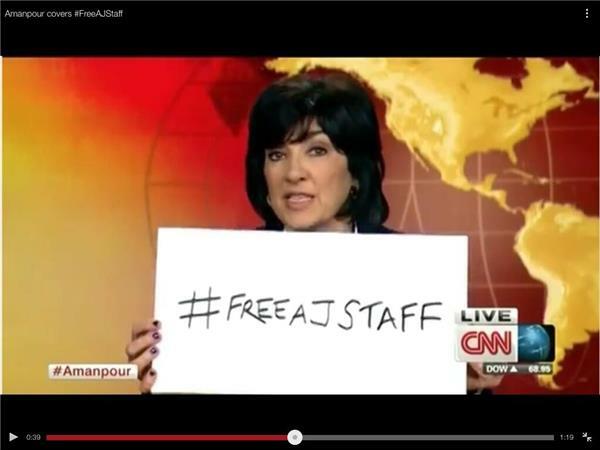 CNN's Christiane Amanpour has thrown her weight behind the #FreeAJStaff campaign. The renowned foreign correspondent and interviewer held up this sign live on air. To see who else is supporting the campaign search the #FreeAJStaff hashtag on Twitter. And why not make one yourself? Our journalists were simply doing their jobs. White House spokesman, Jay Carney, has called for the release of the Al Jazeera journalists in Egypt. He said their rights should be respected "regardless of affiliation." Dutch journalist Rena Netjeshas has fled Egypt after learning she was on a list of 20 people, said to be working for Al Jazeera, who are accused of "fabricating news" and helping a "terrorist organisation". The Guardian has a write-up here. Journalists from around East Africa are demonstrating outside the Egyptian Embassy in Nairobi in support of Aljazeera staff detained in Cairo. Al Jazeera's Mohammed Adow was there. The lawyer for Mohamed Badr, an Al Jazeera cameraman held in Egypt, has been cleared of charges relating to riots in Ramses Square last year. 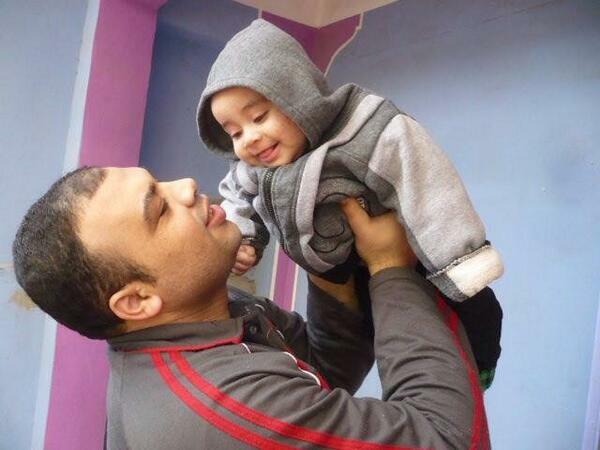 Legally, Badr is not held on any other charges, but a court must order his release from custody. We'll have more when the details are released. Four other Al Jazeera other staff members are being held in Egypt. 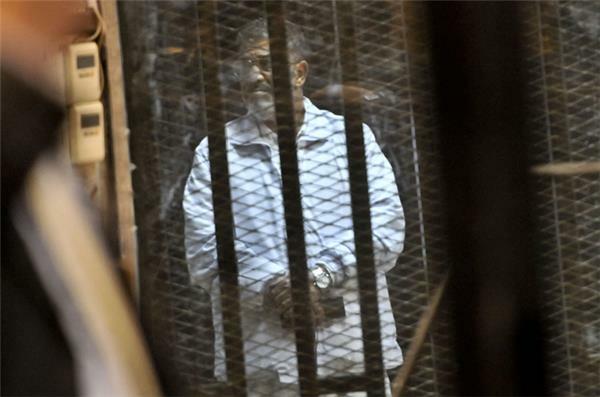 The trial of deposed Egyptian President Mohamed Morsi for inciting the murder of protesters outside the presidential palace, in session today, has been adjourned to Tuesday February 4. 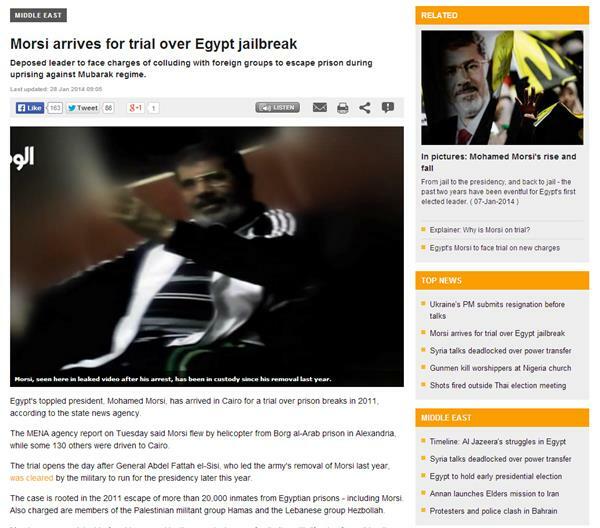 Morsi is also facing a number of other charges in separate trials. One person was killed in Cairo and 53 injured in Gharbia in clashes on Friday, reported Egypt's state news agency quoting the health ministry. 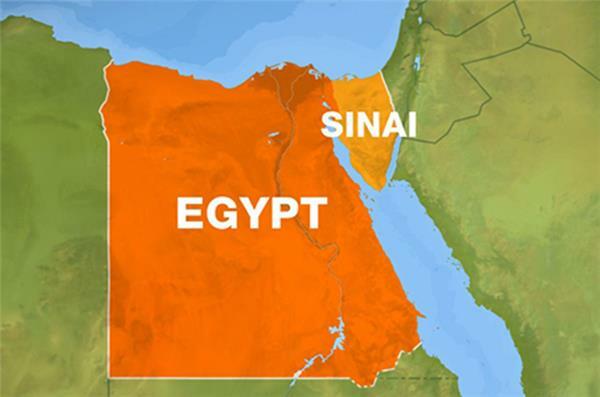 Egyptian military aircraft have attacked villages in the Sinai Peninsula, killing 13 people on Friday. Military spokesman Ahmed Mohammed Ali said the strikes targeted houses, shops, vehicles and other gathering points suspected of being used by armed fighters. "We are extremely concerned about the increasingly severe clampdown and physical attacks on media in Egypt, which is hampering their ability to operate freely. 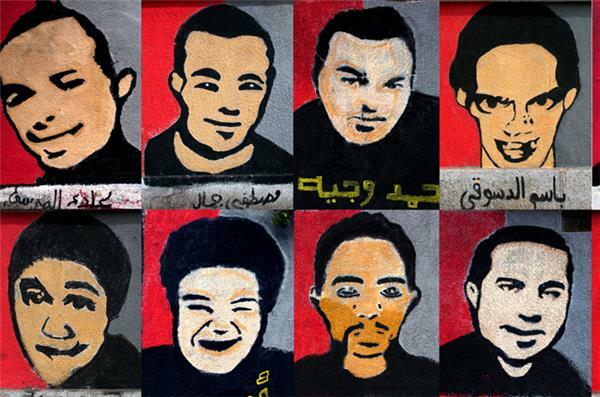 "In recent months, there have been numerous reports of harassment, detention and prosecution of national and international journalists as well as violent attacks, including several that led to injuries to reporters trying to cover last weekend’s third anniversary of the Egyptian revolution. "Unconfirmed reports suggest that several journalists were wounded by live fire as well as rubber bullets last Saturday, some of which may have been fired by opponents of the government as well as by police and other government forces. This accentuates the difficult and increasingly dangerous environment for journalists trying to carry out their work in the country. "A significant number of other journalists covering events related to the anniversary were detained by the authorities, although most are reported to have now been released. "Wednesday’s announcement that the Egyptian Prosecutor-General intends to bring to trial 16 local and 4 foreign journalists alleged to have worked for the international broadcaster Al Jazeera, on vague charges including “aiding a terrorist group” and “harming the national interest”, is also of great concern. "It has not only placed a sharp focus on the systematic targeting of Al Jazeera staff – five of whom are actually in custody - since the fall of the previous government last July, but also led to increased fears among the media in general, both national and international, which is clearly deeply detrimental to freedom of expression and opinion. "Journalists working for other media organizations have reported being attacked by government supporters after being accused of working for Al Jazeera. A video has also emerged which appears to show a police officer threatening a camera crew working for another TV station that, if they did not stop filming, he would tell bystanders they worked for Al Jazeera so that they would be attacked. If confirmed, this lends credence to allegations that the anti-Al Jazeera campaign in Egypt is, on occasion, amounting to incitement to violence. "We have also received numerous reports of intimidation of journalists, who have had their equipment seized, and in some cases of local journalists who have been sacked for reporting on sensitive issues. There are also reports of journalists in detention being subjected to ill-treatment or being held in conditions that are not in line with international human rights standards. "We urge the Egyptian authorities to promptly release all journalists imprisoned for carrying out legitimate news reporting activities in exercise of their fundamental human rights. It is the State’s obligation to ensure that the right to freedom of expression is respected, and that journalists are able to report on diverse views and issues surrounding the current situation in Egypt. All reports of violence against journalists, including the attacks on 25 January, must be independently and transparently investigated." Egyptian court sources say arrest warrants have been issued for 12 people who they say either currently work for Al Jazeera or have done so in the past. Among those wanted, are several foreigners. 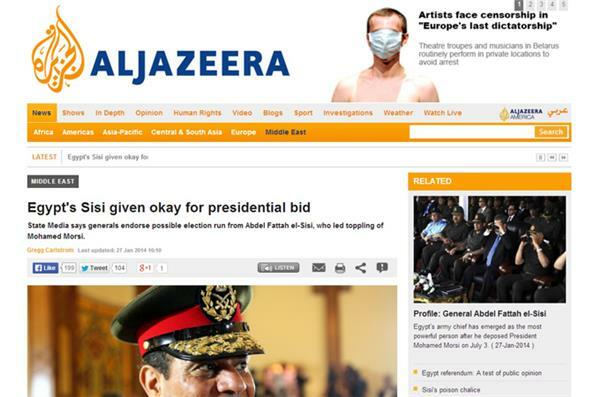 However, the Al Jazeera network has not received any official notice from Egypt’s legal authorities. It has already been more than a month since Egypt detained 3 Al Jazeera English journalists. Peter Greste, Mohammed Fahmy and Baher Mohammed have been held without charge since December 29th. 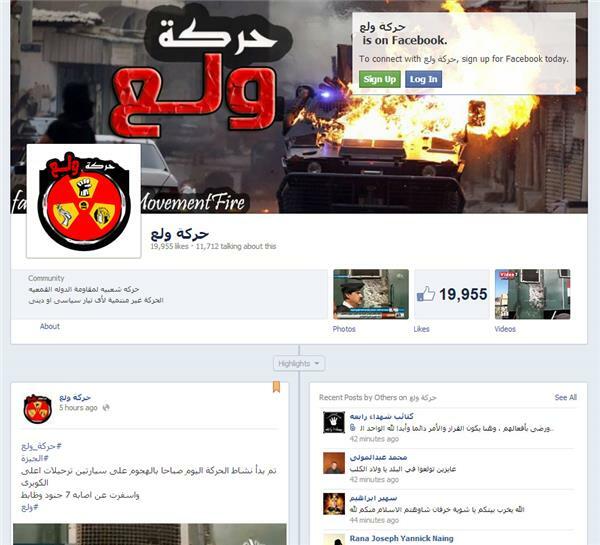 They are accused of spreading false news and having links to the Muslim Brotherhood, which Egypt classified a terrorist organisation on December 25th. The government in Cairo says their cases have been referred to the criminal court by the prosecutor-general. However, the Al Jazeera network has not been notified of any formal charges. Two more journalists from our sister channel have also been detained without charge, for more than six months. Al Jazeera rejects the allegations against all of them and continues to demand the unconditional release of its journalists. Saudi Arabia is pledging to give Egypt up to $4bn in additional aid in the form of central bank deposits and petroleum products, state-run Egyptian newspaper Al Ahram reported on Thursday. Al Ahram, citing an unnamed ministerial source, said the package would be worked out during a visit next week to the Saudi kingdom by Egypt's Interim Prime Minister Hazem el-Beblawi. Al Jazeera's Peter Greste's appeal against his ongoing detention without charge has been denied in a Cairo court. Greste and four other Al Jazeera Media Network employees remain in detention in the Egyptian capital. None of them have been charged. Al Jazeera correspondent Peter Greste appeared in court in Cairo on Wednesday to appeal against his detention. 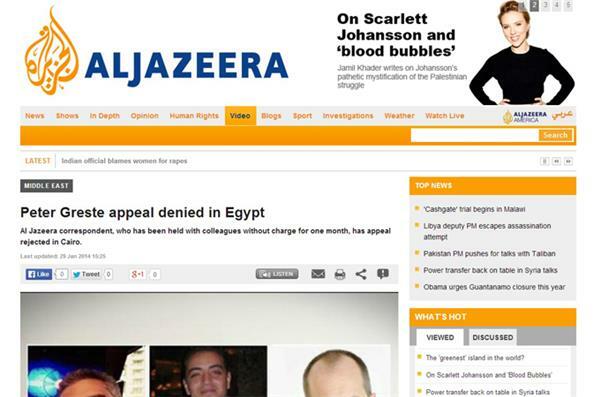 The appeal was denied, and Greste, along with four other Al Jazeera employees, remain in detention without charge. Read Al Jazeera's full article here. Egypt's top military body has given its approval for the head of the armed forces to run for the presidency. Hundreds of protestors have been killed in the six months since the military, led by Field Marshal Abdel Fattah al-Sisi overthrew President Mohamed Morsi. But, despite widespread opposition to military rule, a failing economy and serious social unrest have led some in Egypt to view Sisi as a national savior. Egypt's top generals have cleared the way for army chief Abdel Fattah el-Sisi to run for president, state media has reported, setting the stage for him to declare his candidacy in the coming days. انصار بيت المقدس تنشر فيديو اسقاط الطائرة العسكرية في سنياء " حسبنا الله ونعم الوكيل "
The Ansar Bayt al-Maqdis group, which has taken responsibility for a series of deadly attacks across the country, said its fighters brought down a Egyptian military helicopter on Saturday. The group said the helicopter was shot down near the North Sinai town of Sheikh Zuwayed with a "surface-to-air missile, killing all its crew." The military issued a statement saying five soldiers were killed in a helicopter "accident". Al Jazeera cannot independently verify the authenticity of this video.